Raif Badawi, imprisoned in 2012 for 'insulting Islam,' awarded European Parliament's prestigious Sakharov Prize. Imprisoned Saudi blogger Raif Badawi has been awarded the European Parliament's Sakharov Prize for Freedom of Thought, BBC reported Thursday. Badawi is serving a 10-year sentence after being convicted of insulting Islam and breaking Saudi Arabia's technology laws with his liberal blog. He also was sentenced to 1,000 lashes, spread over 20 instalments, and fined $266,000. The flogging has been suspended since Badawi received 50 lashes in January, a punishment that sparked international outrage. In June, Saudi Arabia's supreme court upheld the sentence against Badawi, who ran a website called Free Saudi Liberals and has been in custody since 2012. 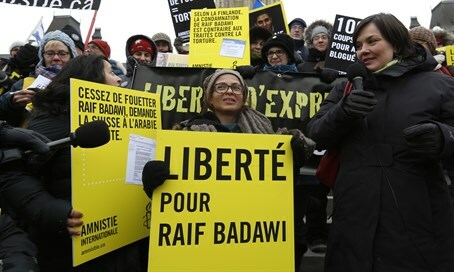 Western governments have condemned Badawi's treatment, and rights groups including Amnesty International have campaigned for his release. Swedish Foreign Minister Margot Wallstrom accused Saudi Arabia of handing a "medieval" punishment to Badawi. The Sakharov Prize, awarded by the European Parliament since 1988, honors individuals or organizations for their efforts in the fight for human rights and democracy. European Parliament President Martin Shulz called on King Salman to free Badawi "so he can accept the prize." "This man, who is an extremely good man, an exemplary man, has had imposed on him one of the most gruesome penalties," Schulz told a packed assembly in Strasbourg, France. "I call on the Saudi king to immediately free him. Relations depend on human rights being respected by our partners... they are not only not being respected but are being trodden underfoot." Badawi's wife Ensaf Haidar, now residing in Canada with their children, called the award a "message of hope and courage" and thanked the European Parliament for its recognition.